Now Participate in Amazon Pay Quiz contest and you can win 5000 Rs pay balance. 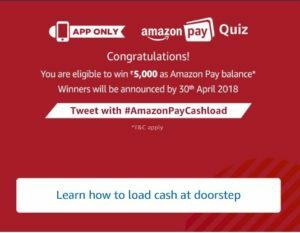 We have added all Amazon pay quiz answers for 28 March 2018 to 20 April 2018. In this contest, total 40 People will win 5000 Rs each. So, participate now and you can be one of them. It will not take more than 1-2 mins to enter all answers. So it’s worth trying your luck. Scroll down on Homepage and you will see a banner about Quiz. That’s it, now use answers same as given below. When you pay for your Amazon.in orders with cash, you can load the leftover change or additional cash into your Amazon Pay balance. According to RBI guidelines, you are required to submit an official valid ID number to add money to your Amazon Pay balance. Which of these are officially valid documents? Which of these is NOT true when you submit your official valid ID number on Amazon.in? Which of these is a benefit of loading cash into your Amazon Pay balance at your doorstep? No need to handle change at the doorstep. Which of the following can you NOT pay for using your Amazon Pay balance?